France's government was to begin evaluating two months of nationwide consultations on Monday before forging concrete measures in response to the discontent over living standards voiced by the Yellow Vest protests. President Emmanuel Macron launched the “Great National Debate” in January in response to nationwide protests over his government's attitude towards purchasing power, taxation and the cost of living. Over two months, the initiative clocked up 10,000 town hall meetings, about 1.5 million online contributions and 100 hours of Macron speaking directly with citizens. Prime Minister Edouard Philippe is set to lay out the first wave of conclusions in Paris on Monday, at an event gathering ministers, experts and members of the public. “Nothing will be the same as before,” government spokesperson Sibeth Ndiaye said Sunday, underlining the extent to which the executive has billed the debate as a key moment of Macron's presidency. Debates included questions on the environment, taxes, public services, democracy, health, pensions and the welfare state. The teams that worked on crunching the data from the debate – which also included 16,000 guest books filled with grievances from mayor's offices around the country – stressed the difficulties of condensing the views of a highly polarised population. “There are a few things that jump out, but the reality is that there are big disparities in opinion on most subjects,” one aide to the prime minister told AFP. Critics have pointed out that older people were overrepresented in the town hall meetings and that most Yellow Vest protesters boycotted the debate. Macron is expected to turn the feedback into policy changes with a major address planned for the middle of April. He has given little public indication of what those may be, but has stressed that demands for tax cuts would need to be accompanied by reductions in public spending. Macron also ruled out reintroducing a tax for the wealthy, a key demand of Yellow Vest protesters, who saw the scrapping of the tax as a sign that Macron was the “President of the rich”. The debate got off to a difficult start, when the main organiser stepped down due to an outcry over her salary. 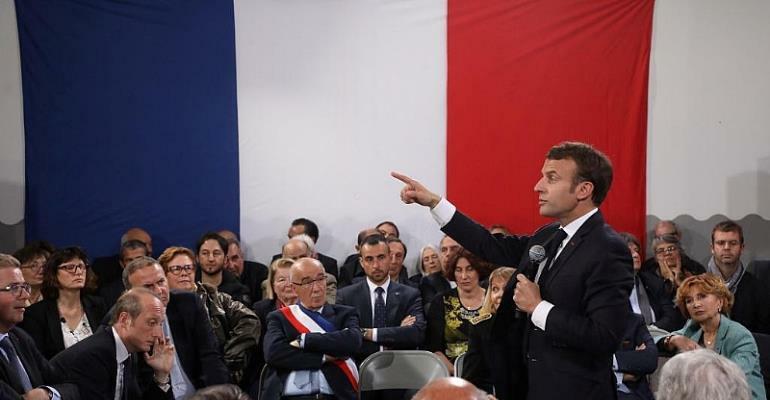 But the tone around the debates improved and even Macron's approval ratings have grown, with recent polls showing around 30 percent of voters with a positive view of the president. Meanwhile, attendance at Yellow Vest protests has been declining in recent weeks. “I intend to transform anger into solutions,” were the words with which Macron laid out the stakes of the debate in January, referring to weeks of roadblocks, demonstrations and occasional rioting on the Champs-Elysées Avenue in Paris. “Your proposals will help build a new contract for the nation,” Macron promised, looking both to channel anger from the streets into constructive debate and to improve his image by showing he was open to discussion.